September 27, 2012 - The EU today filed a request for the World Trade Organization (WTO) to grant $12 Billion in annual sanctions against Boeing in what it calls Boeing’s failure to address the clear verdict it suffered in the WTO’s March 2012 final judgment. It is the largest WTO penalty ever requested and it follows the worst loss a party has seen in the history of the WTO. 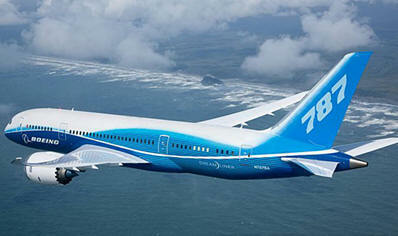 Boeing, in March 2012, had been given a six months reprieve to implement the judgment. The Airbus has stated that the WTO had condemned state, local and federal aid Boeing received in support of every one of Boeing’s current commercial aircraft programs. In a filing with the WTO, the EU has reported “it became clear that Boeing has failed to implement the judgment. With that failure, the case moves to its next phase sanctions following confirmation that Boeing continues to distort the marketplace with taxpayer-funded subsidies”. “Airbus is grateful to the EU Commission for taking consequential action,” said Airbus spokesperson Maggie Bergsma, “However, this is nothing but the next step in a trade conflict that was launched in 2004 by Boeing. The WTO final verdict had called in March for, withdrawal of “at least $5.3 billion” of federal subsidies already received by Boeing, elimination of an additional $2 billion in illegal state and local subsidies due in the future under existing illegal schemes and termination of all U.S. Department of Defense (DOD) and NASA research grants to Boeing, including funding, Boeing use of government facilities and the illegal transfer of IP rights to Boeing. Airbus has said the EU’s requested $12 billion annual penalty is justified by the WTO panel confirmation that the effect of the subsidies is significantly larger than their face value in light of their “particularly pervasive” nature. Airbus believes “according to the WTO”, Boeing would not have been able to launch the 787 without illegal subsidies and WTO’s findings will have no relevant consequences for Boeing. Boeing has continually protested over launch aid in the form of credits to Airbus, while Airbus has argued that Boeing receives illegal subsidies through military and research contracts and tax breaks. In July 2004 Harry Stonecipher (then-Boeing CEO) accused Airbus of abusing a 1992 bilateral EU-US agreement providing for disciplines for large civil aircraft support from governments. Airbus is given reimbursable launch investment (RLI, called "launch aid" by the US) from European governments with the money being paid back with interest, plus indefinite royalties if the aircraft is a commercial success. Airbus contends that this system is fully compliant with the 1992 agreement and WTO rules. The agreement allows up to 33 per cent of the program cost to be met through government loans which are to be fully repaid within 17 years with interest and royalties. These loans are held at a minimum interest rate equal to the cost of government borrowing plus 0.25%, which would be below market rates available to Airbus without government support. Airbus claims that since the signing of the EU-U.S. agreement in 1992, it has repaid European governments more than U.S.$6.7 billion and that this is 40% more than it has received. Airbus argues that the pork barrel military contracts awarded to Boeing (the second largest U.S. defense contractor) are in effect a form of subsidy. The significant U.S. government support of technology development via NASA also provides significant support to Boeing, as does the large tax breaks offered to Boeing which some claim are in violation of the 1992 agreement and WTO rules. In its recent products such as the 787, Boeing has also been offered substantial support from local and state governments. However, Airbus' parent, EADS, itself is a military contractor, and is paid to develop and build projects such as the Airbus A400M transport and various other military aircraft. In January 2005, the European Union and United States trade representatives, Peter Mandelson and Robert Zoellick (since replaced by Rob Portman, and then Susan Schwab, and the present office holder, Ron Kirk) respectively, agreed to talks aimed at resolving the increasing tensions. These talks were not successful with the dispute becoming more acrimonious rather than approaching a settlement. In March 2010, the WTO ruled that European governments unfairly financed Airbus. In September 2010, a preliminary report of the WTO found unfair Boeing payments broke WTO rules and should be withdrawn. In two separate findings issued in May 2011, the WTO found, firstly, that the US defense budget and NASA research grants could not be used as vehicles to subsidise the civilian aerospace industry and that Boeing must repay $5.3 billion of illegal subsidies. Secondly, the WTO Appellate Body partly overturned an earlier ruling that European Governments launch aid constituted unfair subsidy, agreeing with the point of principle that the support was not aimed at boosting exports and some forms of public-private partnership could continue. Part of the $18bn in low interest loans received would have to be repaid eventually; however, there was no immediate need for it to be repaid and the exact value to be repaid would be set at a future date. Both parties claimed victory in what is the world's largest trade dispute. On the first of December 2011 Airbus reported that it had fulfilled its obligations created by the WTO findings and called upon Boeing to do likewise in the coming year. The United States did not agree and had already begun complaint procedures prior to December, stating the EU had failed to comply with the DSB's recommendations and rulings, it requested authorization by the DSB to take countermeasures under Article 22 of the DSU and Article 7.9 of the SCM Agreement. The European Union requested the matter be referred to arbitration under Article 22.6 of the DSU. The DSB agreed that the matter raised by the European Union in its statement at that meeting was referred to arbitration as required by Article 22.6 of the DSU however on 19 January 2012 the US and EU jointly agreed to withdraw their request for arbitration. On the 12 March 2012 the appellate body of the WTO released its findings confirming the illegality of subsidies to Boeing whilst confirming the legality of repayable loans made to Airbus. The WTO stated that Boeing had received at least $5.3 billion in illegal cash subsidies at an estimated cost to Airbus of $45 billion. A further $2 billion in state and local subsidies that Boeing is set to receive have also been declared illegal. The WTO gave Boeing and the US government six months to change the way government support for Boeing is handled. At the DSB meeting on April 13, 2012, the United States informed the DSB that it intended to implement the DSB recommendations and rulings in a manner that respects its WTO obligations and within the time-frame established in Article 7.9 of the SCM Agreement. The European Union welcomed the US intention and noted that the 6-month period stipulated in Article 7.9 of the SCM Agreement would expire on September 23, 2012. On 24 April 2012, the European Union and the United States informed the DSB of Agreed Procedures under Articles 21 and 22 of the DSU and Article 7 of the SCM Agreement.